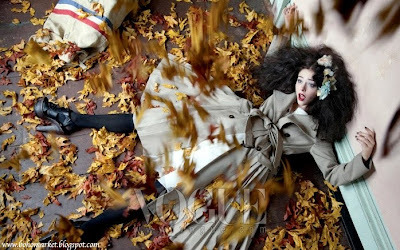 I was blown away by this amazing editorial! These photos are so inspiring, I just love them all. I adore the colors, the styling, the theme, the model, the clothes, and of course the unbelievable work of photographer Toni Kim for Vogue Korea...Everything is just a dream! Este increíble editorial me sorprendió muchísimo! Encontré demasiada inspiración en estas fotos! Las adoro!! Los colores, el estilo, la modelo, la ropa, el tema, el fondo y por supuesto el trabajo increíble del fotógrafo Toni Kim para Vogue Korea...Estas fotos son un sueño! Those are gorgeous photos, I especially love numbers 1.6 and 8 with 8 being my favourite, purely because of all the gorgeous colours in the shot! I'm so glad you posted these piccies up here today. siiii son una pasada de fotos, todas tienen encanto, me gustan. WOW!!!! I'm speechless. This editorial is amazing!!!! The photographs are beautiful. It's really inspiring. Thanks for sharing this, Giovanna! Also, I love love love the song on your page. "Go put your record on, tell me your favourite song...." LOVE! nunca las habia visto pero transmiten muy buen rollo y la ropa me encanta pero sobre todo esos taconazos de cada foto!! Hola GIova!!! hermosas fotos tan artisticas y sobretodo inspiradoras me encantan sobre todo la robe floreada wow!!! gracias por insertar mi boton jejej :) y tengo tus fotos con tu look :) eres un corazon besitos Giova y bien inicio de semana!! These looks are gorgeous! The hair is RIDICULOUS (in a good way)! the hair style is amazing!!!! i fell in love with it....the first pair of shoes is beautiful and i love the colours of this pics....they're so perfect fo fall! I ADORE the fact that she looks like a little ragdoll. I love the exposures also. Son magníficas!!! Gracias por pasarte por mi blog y dejar tus cálidas palabras!!! Buena semana!!! definitivamente inspiradoras, me encantaron , excelente aporte Giovanna. Acabo de conocer tu blog y me he hecho seguidora. Te invito a que te pases por el mío. haha oh my gosh such fun hair! Woop woop for Fall! Gorgeous pictures! Wow, this whole editorial is stunning! The outfit in the first photo is my favorite, that skirt is amazing. Very lovely. This is such a great selection of pictures! 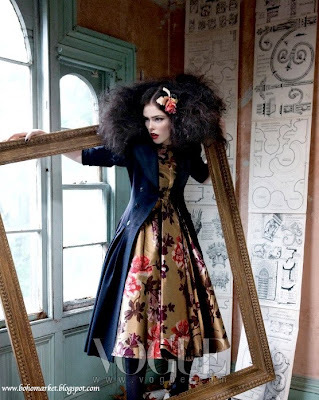 coco rocha never fails to look fierce in any editorial. i love the scenery of all the photos. giovanna can you check my italian assignment? Ayer mientras leía algo de moda por la Web caí en tu Blog, me gustó sobretodo la bienvenida con Corinne, también me gusta, gracias por seguirme. Un abrazo y espero que también vengas por fiestas navideñas. really, really beautiful-and those shoes are a-mazing! Recien llego de viaje y me he puesto al día con tu blog que esta lindo como siempre!, me encantan tus ultimos post, tus friday´s inspiration! que alegria leerte despues de este tiempo amiga! Ah!! salen muy linda en tu post sobre Zara! These are so fantasy like...love the model cocoa, she looks like a real live doll here! Great shots! Love the Gilda Radner hair! This editorial is so amazing! I love the first three shots in particular, they're so striking. great hair style with red lipstick. The style is good for fall, wearable, classic and velvet is a must. Buenísisisima la producción. Las producciones de los Vogues asiáticos tiene un punto de creatividad que me fascina. Like the vogue pictures! Love it so much!